Just a short drive from the Alabama Gulf Coast, there are some world-class attractions that draw thousands of visitors a year. So, you might think about planning a day or two into your next family vacation to check out some of these area attractions. History buffs shouldn’t miss this chance to see a real World War II hero. Prior to being decommission in 1947, The Battleship USS Alabama had quite a storied past. Known as the “Hero of the Pacific,” the Alabama served in both the Atlantic and Pacific theaters. At the end of the war, she embarked 700 sailors, principally members of Navy construction battalions (or “Seabees”), as a part of her mission in Operation Magic Carpet to return American servicemen home as soon as possible. The Alabama accumulated nine U.S. Navy battle stars for her World War II service. The Alabama was taken to Mobile Bay and opened as a museum ship in 1965. Visitors are allowed to view the inside of the main gun turrets and anti-aircraft guns. And thanks to the addition of a stairway, you can also see the powder magazine. 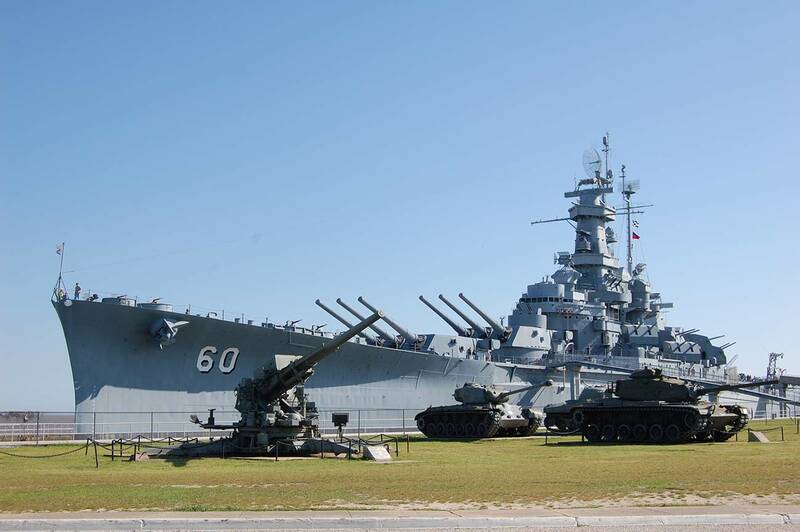 USS Battleship Alabama, 2703 Battleship Parkway, Mobile, AL. Open every day except Christmas Day. Admission: Age 12 & up: $15; Ages 6-11: $6; Active or Retired Military and under age 6: Free; Discounts for groups, senior citizen, military dependents and AAA Members. Walter Bellingrath once said “The gardens are like a beautiful woman with a different gown for each week of the year.” Bellingrath, the first Coca-Cola bottler in Alabama, originally bought the property in 1917 as a fishing camp. Even though Bellingrath Gardens is famous for it’s azaleas and award-winning roses, there is literally something blooming year-round in the 65-acre garden estate. Camellia blooms in winter, azaleas in spring, roses in the summer, chrysanthemums in autumn and, during the holiday season, the garden turns into a Magic Christmas in Lights. You can also tour the Bellingrath Home, complete with its original furnishings and Mrs. Bellingrath’s extensive collection of decorative arts. Built in 1935, the 10,500- square-foot home was designed by prominent architect, George B. Rogers. Bellingrath Gardens and Home, 12401 Bellingrath Gardens Road, Theodore, AL. Open year-round 8 a.m. – 5 p.m. except certain holidays. Admission: Garden only: Adults, $12.50; Children (5-12), $7. Garden and Home: Adults, $20.50; Children (5-12), $12.50. A popular wintering spot for artist and intellectuals (including Sherwood Anderson and Upton Sinclair) in the early 1900s, downtown Fairhope surprises you with its beauty, history and charm. Located just off the shore of Mobile Bay, the vibrant downtown scene is complete with art galleries, boutiques, bookstores, antique shops and even restaurants that have been featured on the Food Network. Each season of the year brings different festivals, art shows and concerts to downtown Fairhope. The National Naval Aviation Museum is the world’s largest Naval Aviation museum and one of the most-visited museums in the state of Florida. The museum, which is located at NAS Pensacola, showcases more than 150 beautifully restored aircraft representing the Navy, the Marine and the Coast Guard. Once you’ve looked at the planes, don’t miss the opportunity to simulate flying in one of the museum’s interactive exhibits. They have an IMAX theater (with the largest screen in Florida), a 3D Flight Simulators, a Blue Angel 4D experience, cockpit trainers, a virtual flight deck and a Kiddie Hawk Play area. The 3D Flight Simulators allow you to experience horizontal rolls, longitudinal pitches and vertical climbs in a multi-sensory experience. Or check out the Blue Angels 4D experience and feel like you’re the pilot in a Blue Angel’s air show. Naval Aviation Museum, 1750 Radford Blvd., Pensacola, FL. Admission is free to the museum, cockpit trainers and Kiddie Hawk Play area. The IMAX theater, the 3D Flight Simulators and 4D Blue Angel experience are priced separately. Hours of operation: 9 a.m. to 5 p.m. daily. Closed Thanksgiving Day, Christmas Day and New Year’s Day. Voted one of the Top 15 Science Centers in the country, the Exploreum is the only science technology center serving south Alabama, south Mississippi and northwest Florida. Exploreum visitors can experience more than 150 hands-on science adventures in three permanent galleries: Hands On Hall, the Wharf of Wonder, and My BodyWorks, the most advanced health exhibit in the nation. The Exploreum also features large-scale, family friendly, interactive traveling exhibits, demonstrations and an IMAX theater. Gulf Coast Exploreum Science Center, 65 Government Street, Mobile, AL. Open Tuesday – Saturday from 9 a.m. – 5 p.m. and on Sunday from noon until 5 p.m. Admission: $16 for adults, $15 for seniors and young adults (age 13-18) and $13.50 for children (2-12). Leave a comment below if you have a favorite day trip that we didn’t cover here.